Partnered with UN Environment, The MeshMinds Foundation is a not-for-profit arts organisation that is focused on enabling sustainable development through creative technology. Our vision is to tackle global challenges from an Asian perspective. Our mission is to connect artists with the world’s most socially responsible companies to work on immersive artwork and experiences focused on the sustainable development of people and our planet. We offer each artist the latest technology, training and mentoring to push the boundaries of their medium. • Exploring win-win situations for private sector engagement for sustainable development. 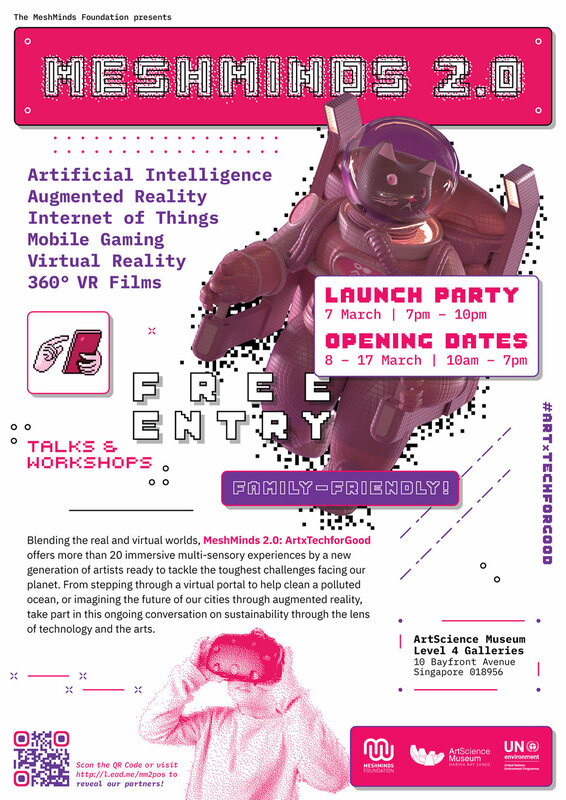 MeshMinds 2.0: ArtxTechforGood offers more than 20 immersive multi-sensory experiences by a new generation of artists ready to tackle the toughest challenges facing our planet. From stepping through a virtual portal to help clean a polluted ocean, or imagining the future of our cities throughthe lens of augmented reality, take part in this ongoing conversation on sustainability through the lens of technology and the arts. Asia VR/AR Impact Lab is the Singapore-based not-for-profit research arm of The MeshMinds Foundation. We are a network of leading academic researchers, content creators, technology companies, impact investors, science museums, and cultural institutions based in Asia focused on measuring the impact of Asia VR/AR content. Our mission is understand the engagement, empathetic response and behavioural changes linked to VR/AR experiences focused on social, ecological, and economic challenges. Read more about about our research and development programmes.